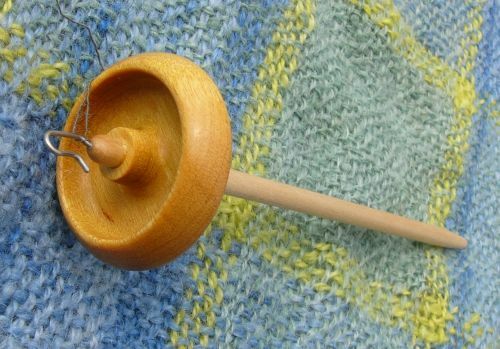 I think trying out a spindle before buying is even more important than trying out a wheel - nearly unusable spindles ARE being sold. If that is impossible, I would either buy a supposedly VERY good spindle - for good money. Or make a spindle myself for next to nothing. I've heard there are very good spindles for under US $ 20 - but I haven't bought one yet. I would certainly stay away from very heavy (80 g / 3 oz. - and more) "beginner's spindles" (I think Ashford sold one of those). Unless you want to spin rug yarn, the simple weight of your spindle will break the yarn - not what a beginner needs! For plying these ultra-heavy spindles may be fine - but first you need something to spin your single with. They are made by Jonathan and Sheila Bosworth (http://www.journeywheel.com) and come in different sizes, weights and woods (or even exotic materials like mammoth tusk). All are top-whorl spindles in cup form, i.e. the rim is broader than the center which makes for long spinning. Each spindle is different, but all whorls are solid and made from one piece of wood. The wood is oiled and polished to a high sheen - there's no varnish! 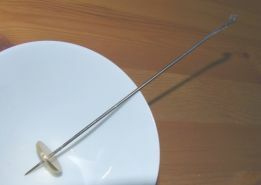 The spindle shafts for the standard version are made from a light-colored, untreated (still very smooth, though) wood. Exotic woods are optional (and cost more). My spindles have the standard shaft and work and look very well. My featherweight spindle weighs 13 g (= 0.46 oz.). The weight varies according to the wood used. Mine is a great spindle for very fine thread - it spins for a loooong time! My two midis (I couldn't make up my mind which to buy - they were both so beautiful!) weigh 35 g (1.25 oz.) each and are perfect for medium threads. They are as perfectly balanced as the Featherweight and a joy to work with! Golding spindles (http://www.GoldingFiberTools.com) are characterized by a bronze alloy ring encasing the whorl. This ring brings the weight to the outside (like the broad rim of the Bosworth spindles) and makes for longer spinning. 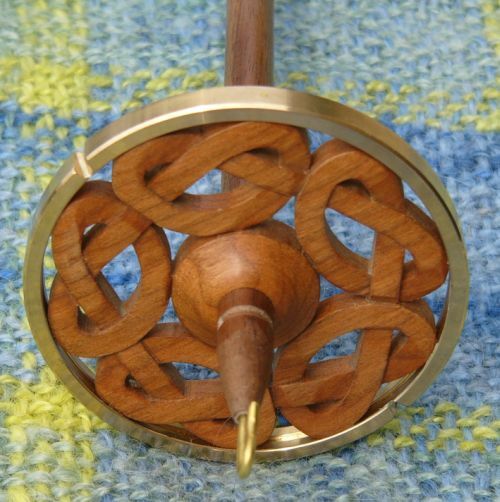 My first spindle from the Golding range was the 3 inch Celtic Knot spindle. At 53 g (1.9 oz.) it is at the upper weight limit of what I consider reasonable for spinning. I use it mainly for spinning fairly thick yarn for knitting sweaters - and it's fantastic for that. I call it a "barstool spindle" - when you spin sitting in a normal chair the spindle will hit the floor before it stops spinning! The walnut shaft is ribbed. That does not bother me, but I've heard from somebody that they actually find it hard on their hands. The older Golding spindles were shipped as top-whorl, but could be converted to bottom-whorl. Today this is no longer the case, but if you want a bottom-whorl, Tom Golding will make you one. This is a spindle from the Vintage Spindles range. The mandalas are unique - when you are interested in one, Tom will e-mail you pictures of those he has in stock. You are left with the difficult task of choosing one. Mine weighs 0.91 oz, has a 1 3/4 inch whorl and a walnut shaft that measures 3/16 x 6 3/4 inches. My spindle does not have a notch in the whorl, but I've figured out how to fill it to capacity nevertheless. 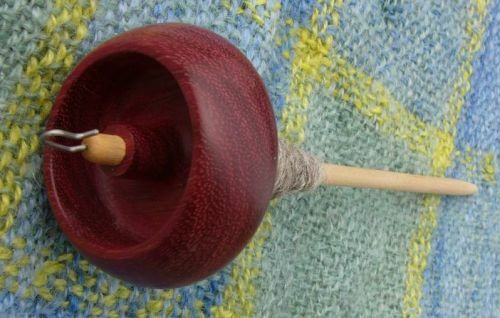 Here's how: Spinning on a top-whorl spindle without notch. I picked the spindle for its looks. As it is not rim-weighted, I didn't expect too much of its spinning properties. Boy, was I surprised! 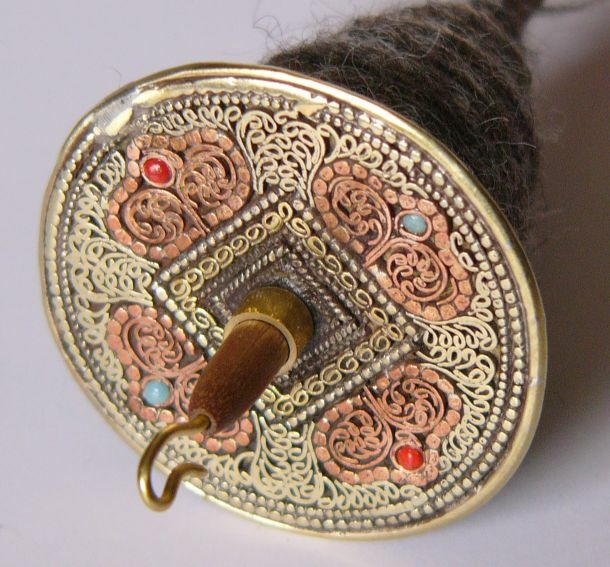 This spindle is beautifully balanced and spins extremely fast and long. I love it so much that I had to create a project for it... 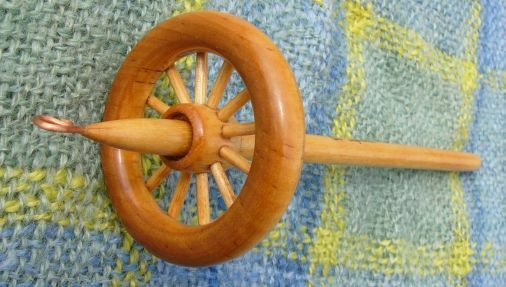 It is a rather specialized spindle: Due to its rather small whorl and a rather thin and short shaft, it is only suitable for fine yarns (my first yarn on it was a 40 wpi wool single). For this purpose it is excellent - and so beautiful that using it is sheer joy. A Canadian couple, Paul and Jeanne Hubbard, were behind Simple Market Farms, but they seem to have disappeared from the Web. Their spindles are spoked wheels (toy wheels) sitting on a varnished and very smooth, tapered shaft. This is the only shaft where I actually managed to slide off the whole cop (=wound-on yarn) without disturbing it. I have two spindles from them, the "Sleeping Beauty" at 30 g (1.07 oz. ), and the "Briar Rose" at 11 g (0.39 oz.). I like the Briar Rose better than the bigger spindle - it's fine for extremely thin thread. The Sleeping Beauty is a decent spindle, but a long way from spinning as well as a Bosworth. The copper hook is nicely shaped, but pretty soft and will bend if the spindle falls on a hard floor. I bought a takli directly from India (e-Trade Enterprises - they also sell on E-Bay under the name of ecomtrader). 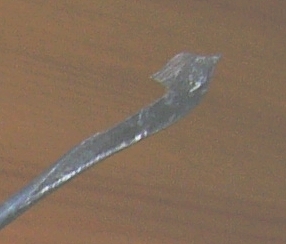 The flat hook is characteristic for taklis made in India. Notice the sharp tip at the top of the hook - during spinning the yarn will snap off this tip (as off the tip of the spindle when spinning with the charkha). As this is my only takli I cannot say how it compares to others and whether there are considerable differences between them. I spin mine in a china bowl - but any other support with a hard, glossy finish would do. The glossier the finish, the less friction and the better spins the spindle. By the way - that tip is SHARP! Spinning the spindle on your thigh for rolling up the yarn is not a good idea!